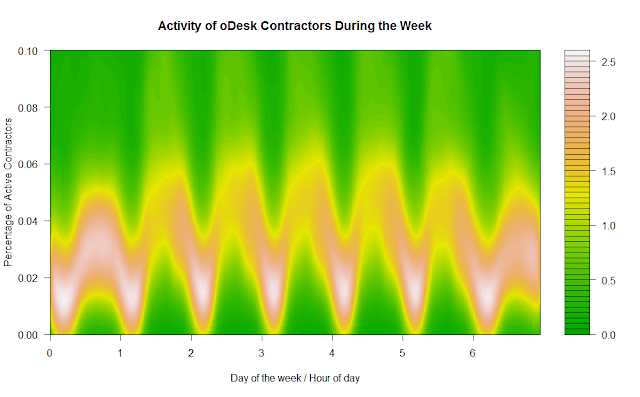 In the few couple of weeks, while at oDesk, I am trying to learn the data stored in the database, and I create random plots to understand what is happening in the market. My absolutely favorite source of data is the data about the micro-level activity of the workers (when they work, how much they type, how much they move the mouse, etc.). A few weeks back, I posted a blog about the activity levels of different countries, with the basic observation that the activity in Philippines fluctuates much less within the 24-hr day compared to all other countries. This is periodic data, which means modular thinking. When you visualize periodic data using a linear plot, you necessarily have a cutting point for the x-axis, which can affect the perception of various trends in the data. You should use something similar to the Flickr Flow, e.g a radar plot in Excel. Unfortunately, it is not truly informative due to the huge number of countries in the plot. But I think it works well to give the global pace of activity over the week and across countries. The plot above is kind of interesting and indeed it shows the pattern of activity. However, we have a lot of "overplotting", which makes the plot busy. It is hard to understand where the majority of the lines are falling. I like how this plot shows the typical activity across countries, which ranges from 2% to 6% of the total registered users. At the same time, we can see (the yellow-green "peaks) that there are also countries that have 8% to 10% of their users being active every week. So, what did I learn from all these exercises? While I could create nice plots, I felt that static visualization are at the end of limited value. Other people cannot do any dynamic exploration of the data. Nobody can customize the plot to show a slightly different view and in general we lack the flexibility given by, say, the visualization gadgets of Google or by the data driven documents created using d3.js.